Bed Bath & Beyond: Amazon Echo clearance 25.99!!! Thread: Bed Bath & Beyond: Amazon Echo clearance 25.99!!! 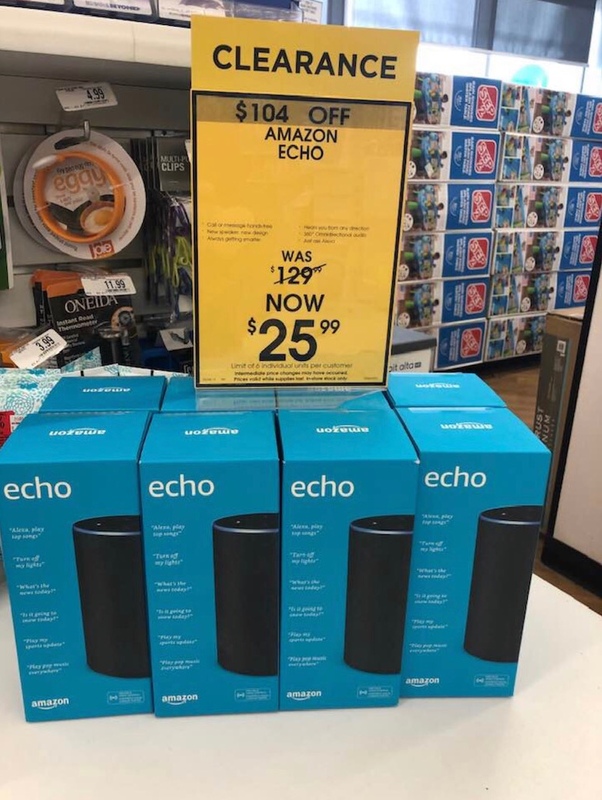 Seen Amazon Echos on clearance at Bed Bath and Beyond for 25.99! torontogal12, Cake, dededi and 1 others like this. I called the store Newmarket and they were sold out. I asked him to check other stores and he said he did and they were sold out and that they went really quick as soon as they went on sale. If you do happen to find one I believe the one on sale does not do things like turn lights etc on or off. I have 3 of these second generation amazon Echos at home and they DO turn On/Off my light fixtures. This photo was from the Kitchener location. I bought mine from the Cambridge location. This was from the Kitchener location. The differences between devices themselves (Echo gen.1/gen.2 and Echo Dot gen1/.gen2) are essentially size, speaker quality, microphone grade, and aesthetics. Every Echo device all function basically the same. They all operate on the cloud-based Echo/Alexa service which is what gives you the functionality of all of their services, including smart-home devices.